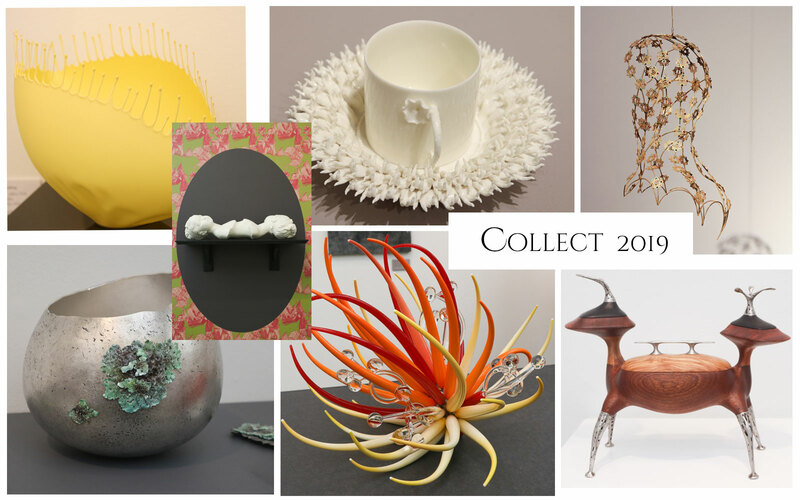 – Collect is an event that is one of the highlights of my year. It’s so exciting to get the opportunity to see so much beautiful Craft and meet talented makers from all over the world. This years show, yet again was filled with so much to see it was totally mind blowing. I had decided just to photograph the special things that caught my eye. But, as ever, I got carried away and it’s been an immense job, editing the hundreds of photographs, to select just a few. I have selected some of my highlights. Artworks that I found either beautiful or interesting and hope you will enjoy seeing some of the amazing work on show. I have chosen my favourite crafts and put them into sections for you to browse. 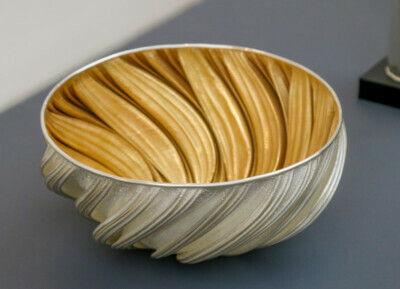 Starting with the experimental ‘Collect Open’ and then continuing with a selection of Glass, Ceramics, Metals and Wood. 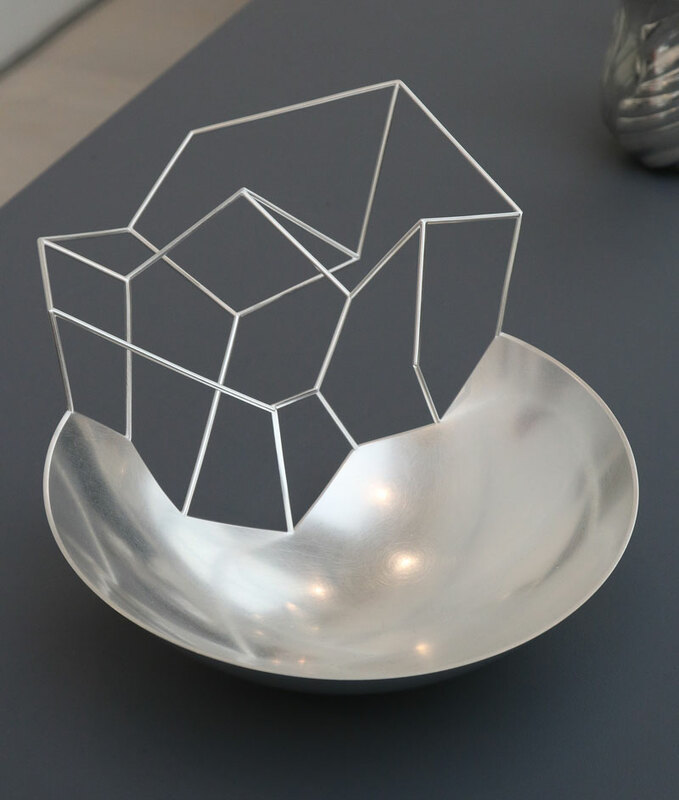 Collect Open presents 15 new works by 17 artists and makers. Presenting work that is ambitious and risk taking. Themes are personal and Universal. 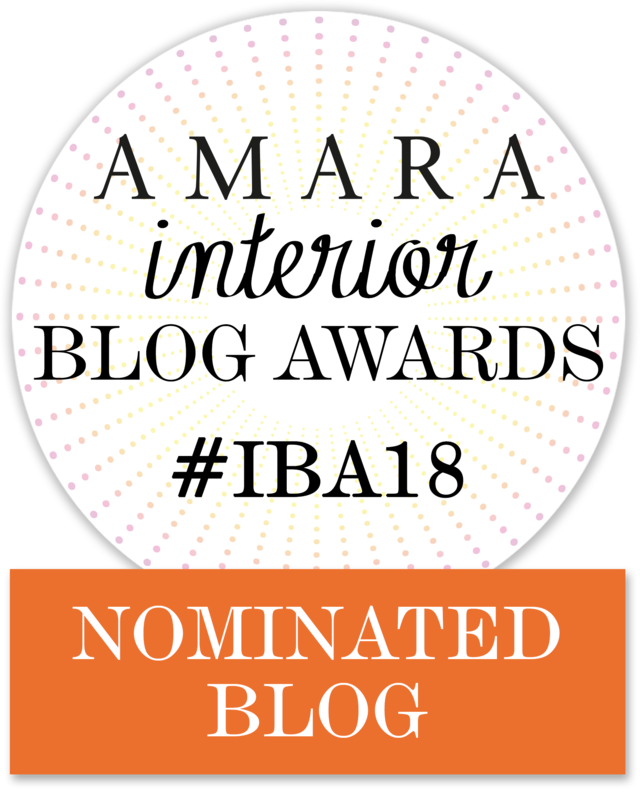 They include:- shining a light on threats to our natural world, religious and gender politics and the contemporary relevance of ancient civilisations in craft practice. 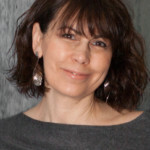 In support of Global wildlife we had ceramic artist Charlotte Mary Pack. 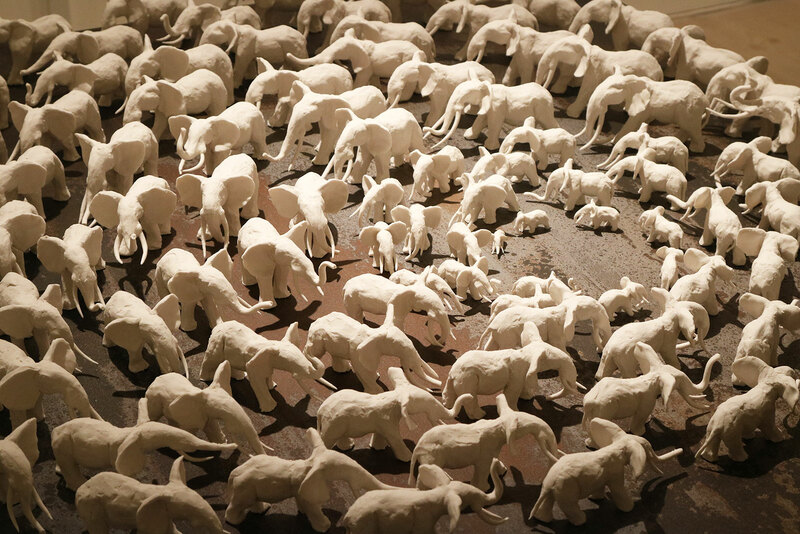 On Dec 4th 2018 she spent Conservation Day hand-sculpting 100 Elephants in porcelain. Each piece represents one of the 100 Elephants that are killed everyday to supply the Ivory trade. Mary is hoping to raise awareness and challenge the public’s opinion on ivory. Last Year Mella Shaw was highlighting the issue of Plastic waste in the ocean and this year it’s the turn of Louis Thompson and Sophie Thomas. 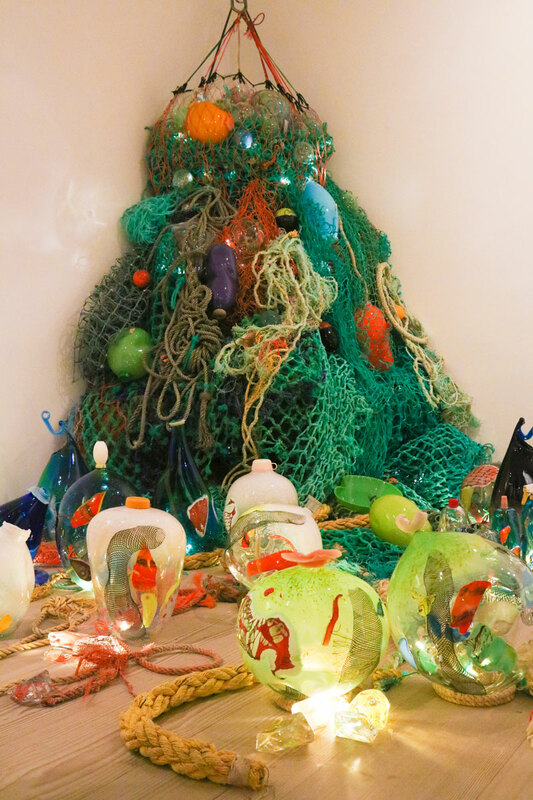 Their installation was quite striking with colourful handblown glass, with found glass and found Ocean plastics. American Mary O’Malley’s Barbecue setting was created to portray cultural confusion. 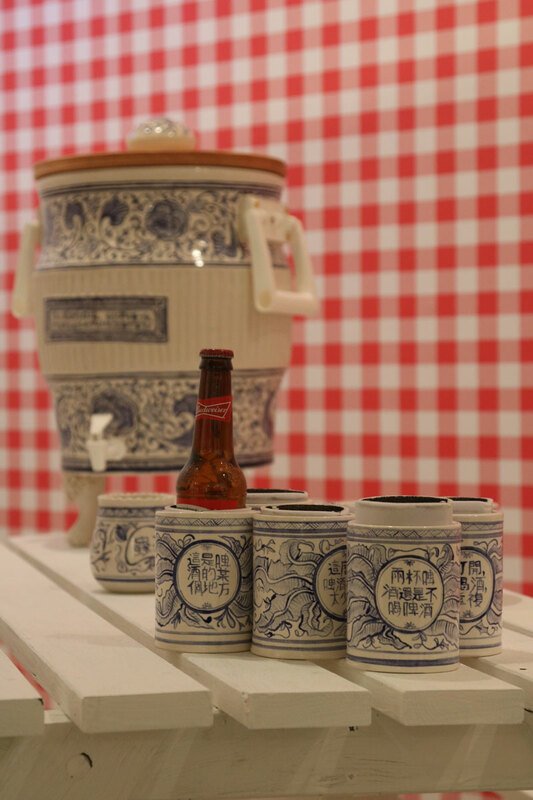 American everyday items are decorated as Chinese exports in the style of the blue and white decoration of Ming Dynasty Qinghua porcelain. Showing the traditional chinese crafts, cheapened and commercialised for American culture. 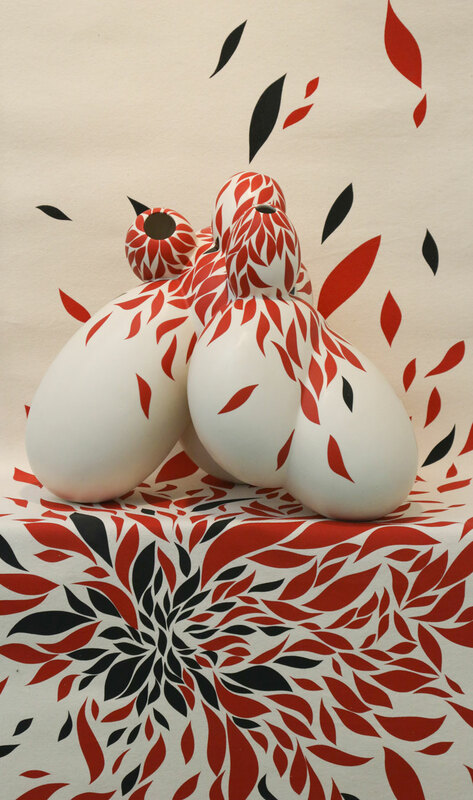 Tina Vlassopulous is concerned with social interactions and friends and has created a long table on which she seats abstract ceramic sculptures that represent the personality of each of her friends. 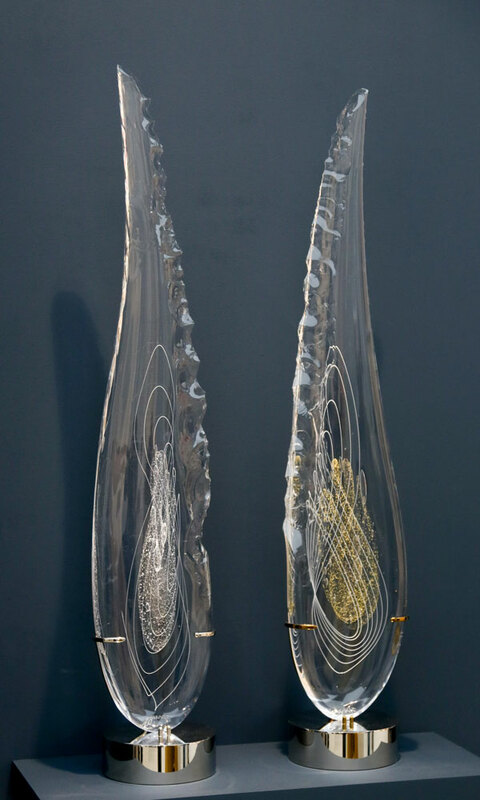 Featuring glass, Susan Kinley’s installation reflects the landscape of Cornwall. 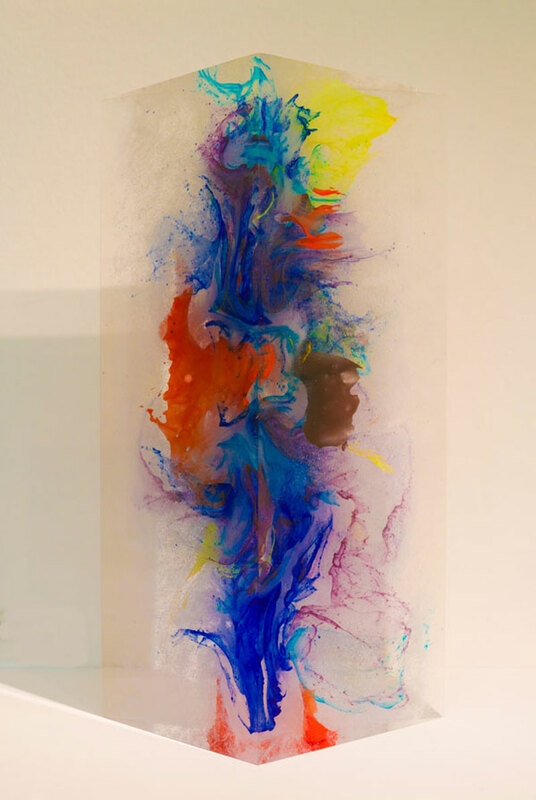 Fragments of imagery are layered within kiln-formed and water jet cut-glass. Mapping the contours of lichens and ancient stones. 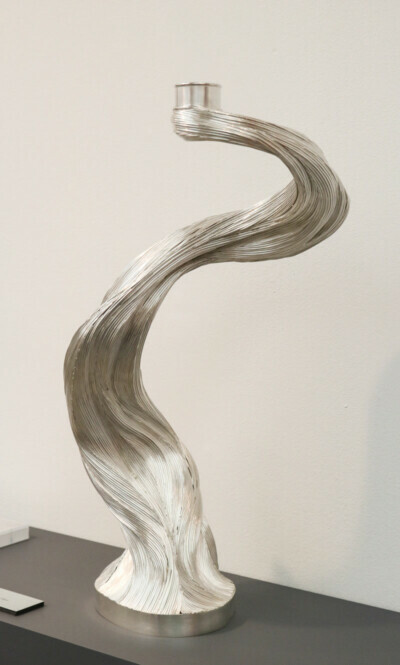 Janine Partington’s work ‘Marking Time’ is a personal response to her father’s Alzheimer’s disease. Marks of time and fragments of memory lost, are carved into acrylic painted leather. Sara Peymanpour created her Hejab art installation to challenge the traditional concepts of culture, image and product utilization. The golden headpiece represents the hejab that has been has been imposed on Muslim women, by tradition and her personal rebellion against it through-out the years. 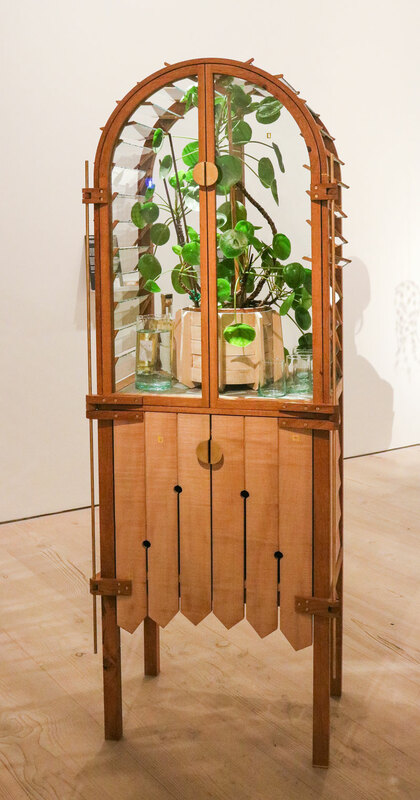 George Winks displayed a unique, experimental Cabinet. Inspired by the architecture of Victorian Railway Stations. 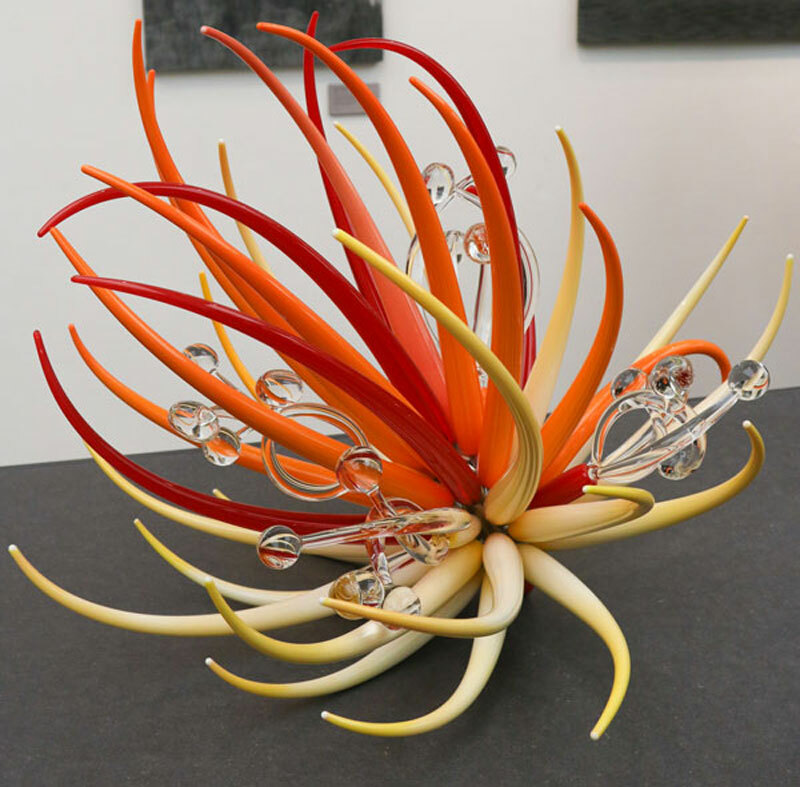 It’s wonderful to see such beautiful work from some of the top Glass Artists. 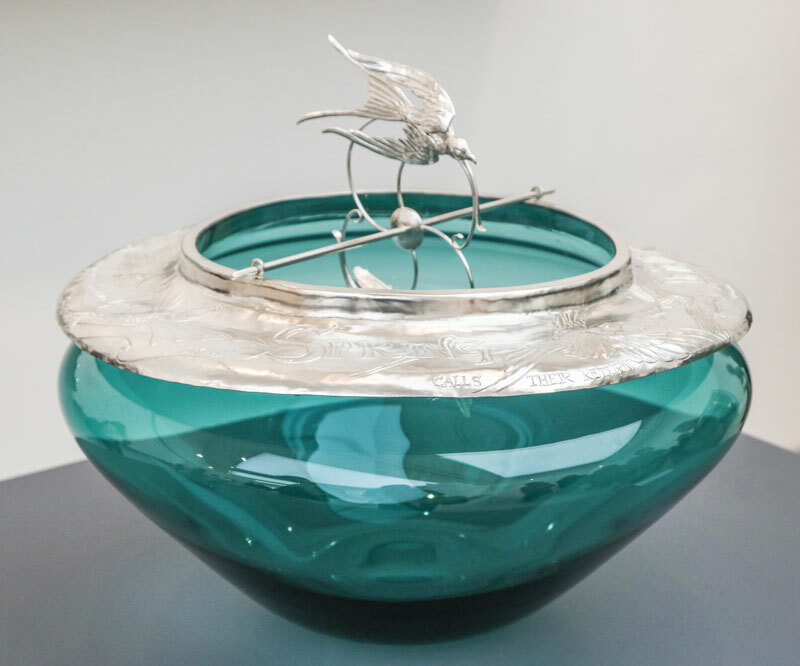 Some fabulous new creations from Peter Laycock, Tim Rawlingson, Louis Thompson and Bruce Marks on the London Glassblowing stand. 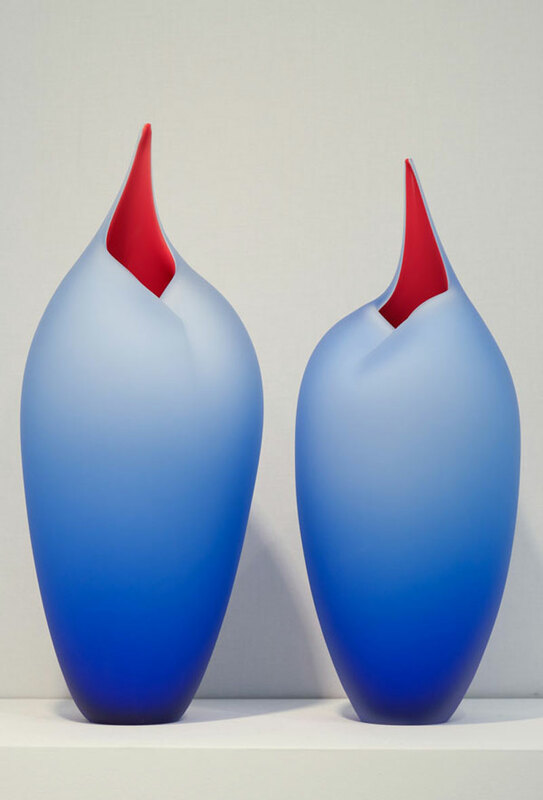 It was good to meet Tim Rawlinson and hear him explain how he achieves the wonderful effects inside his glass. At Vessel Gallery other top Artists were on show. 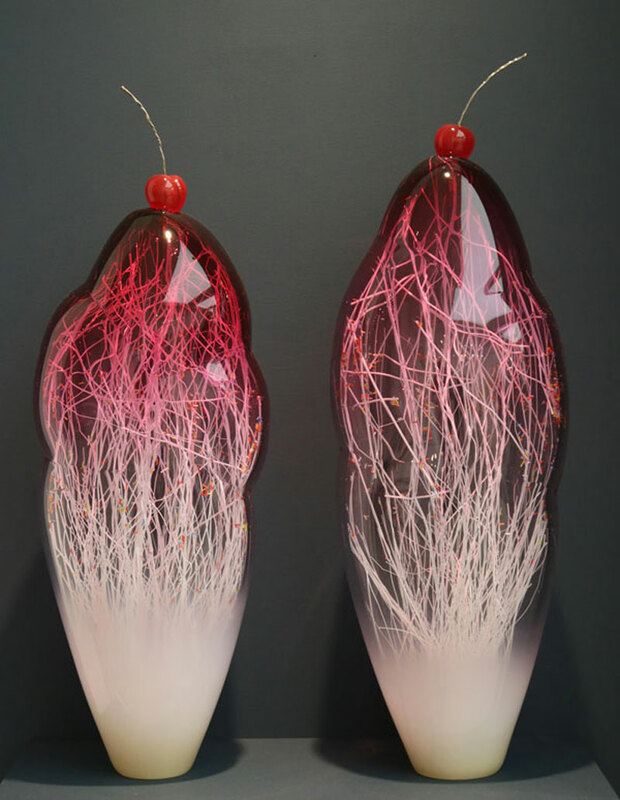 Enemark & Thompson topped their facinating pink orbs with Cherries. 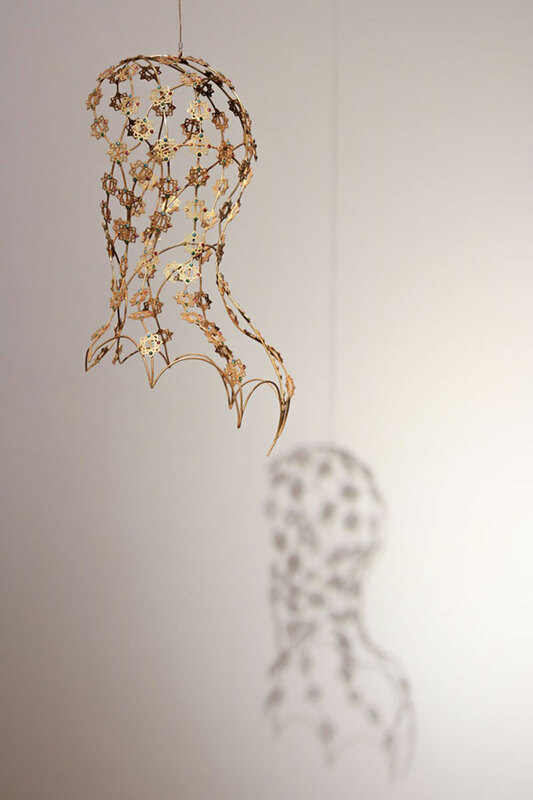 James Devareaux has embedded silver and gold designs inside his translucent shards. 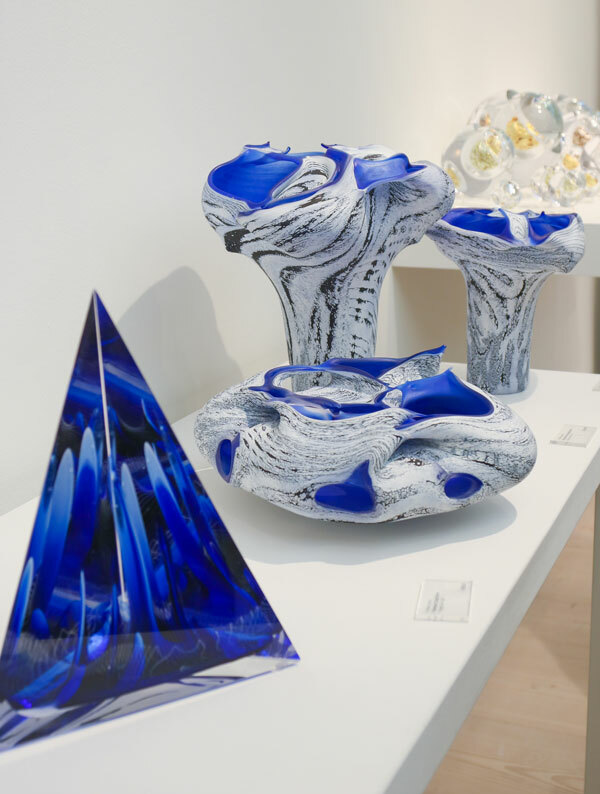 I have featured Eliot Walker’s work on our London Art Fair review and it was good to see some more unique glass sculptures from him. 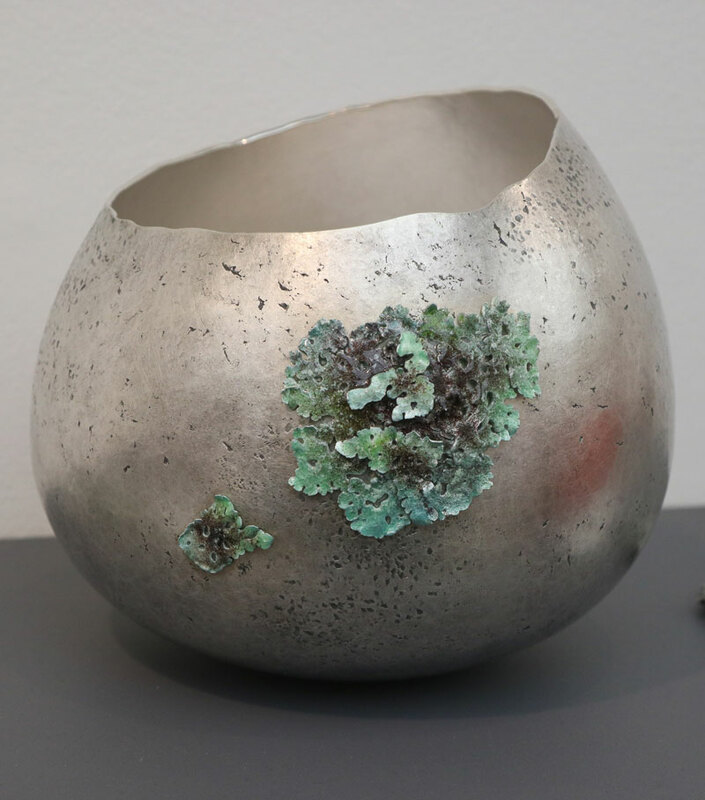 Other designs that were memorable for me this year were from – Vicky Higgins at Craft Scotland, Neil Wilkin at Ruthin Craft Centre and as ever I can’t keep the camera away from Steffen Dam’s botanical glass jars. 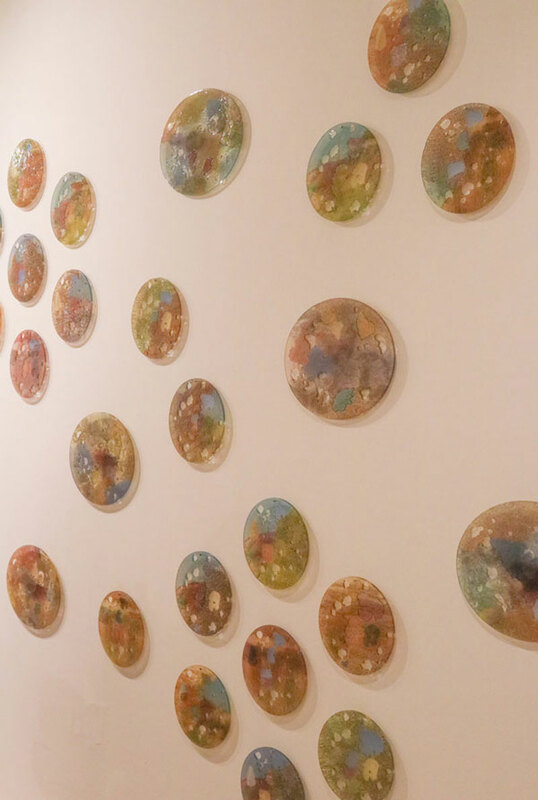 It was great to see the wall of colourful designs from Myung Nam An on the Cube Gallery. Called the eye series – it certainly was eye catching and stunning with all it’s fabulous colours and textures. The colourful creations on the Cynthia Corbett Stand are from Tessa Eastman. 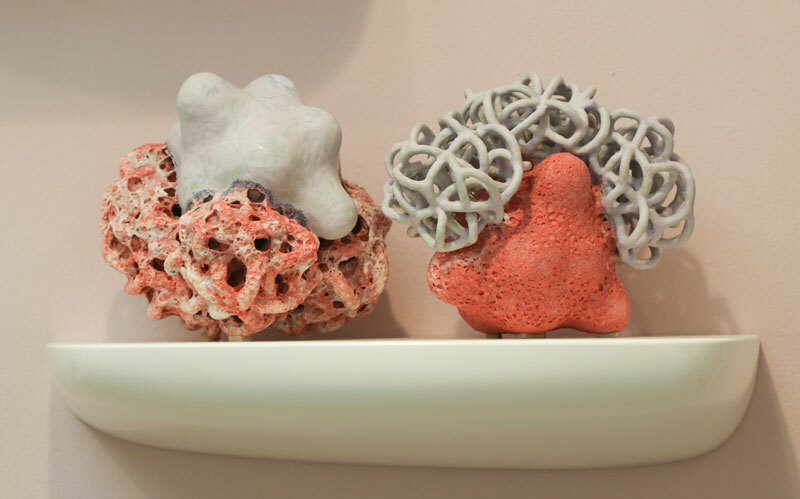 With glazed ceramics, inspired by microscopic organic forms. Simone Perrotte’s ‘Camoflage’ on The Maison Parisienne stand was a striking installation of orange and black patterned stoneware, enamel and screen printed canvas. 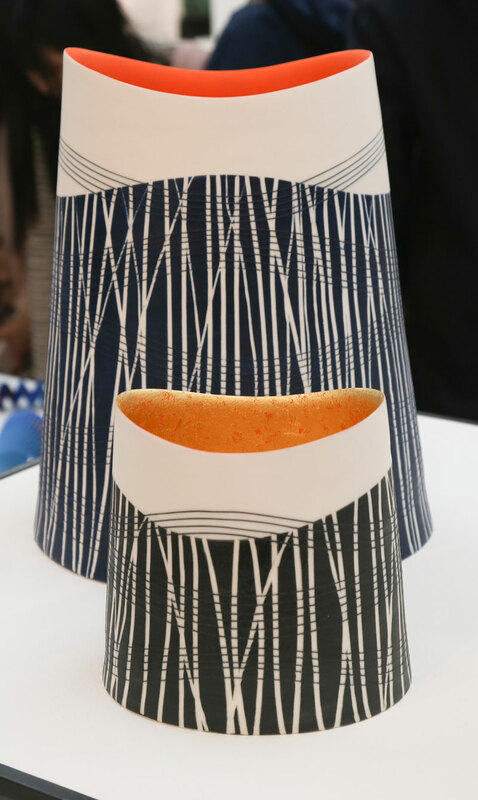 Following with the effective black and orange combination – the beautiful delicate designs of Lara Scobie at Craft Scotland. 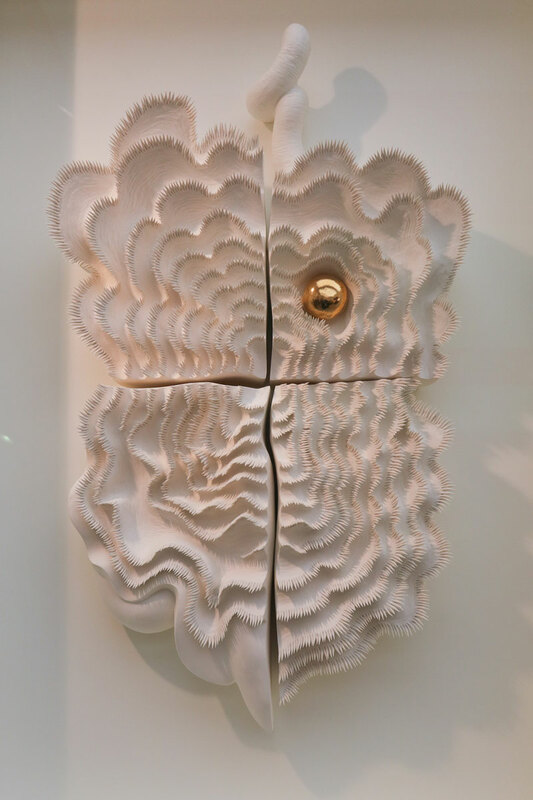 It was interesting to see ceramics replicating unusual textures, resembling flocking and soft surfaces. 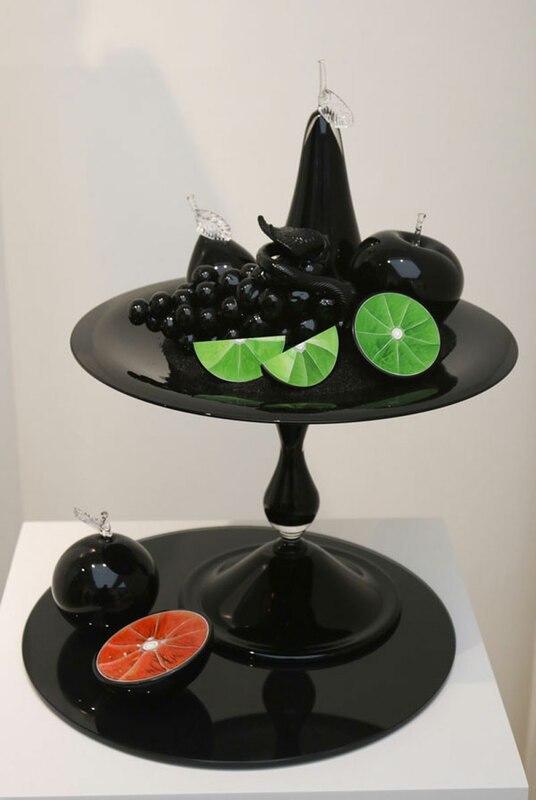 The work of Theis Lorentzen on the Joanna Bird Gallery stood out for it’s kitsch take on sentimental ornaments. Produced in coloured earthenware slip. 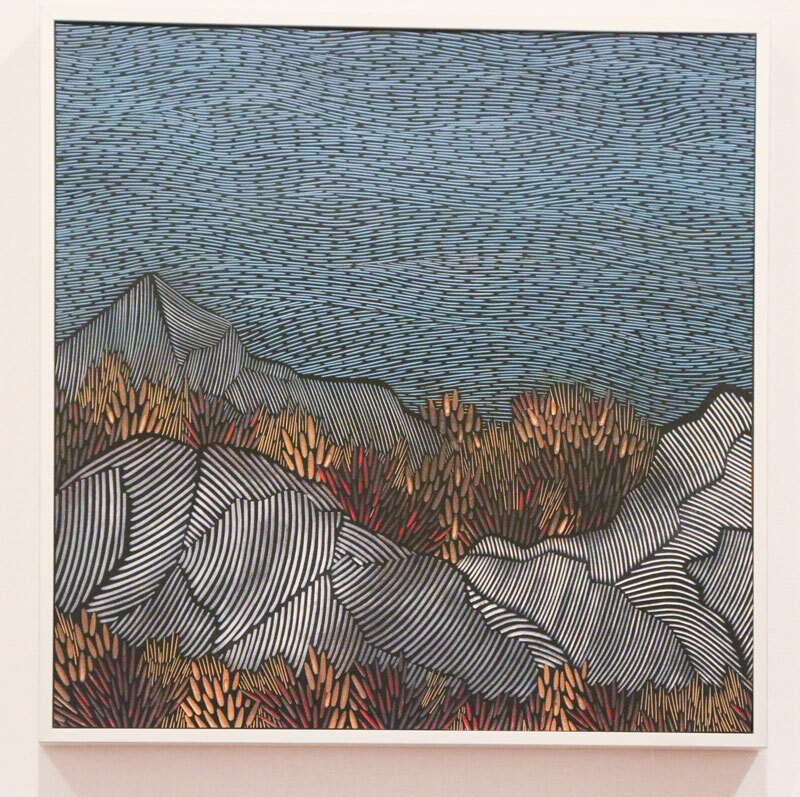 Another artist that creates a similar surface effect is Claire Lindner. 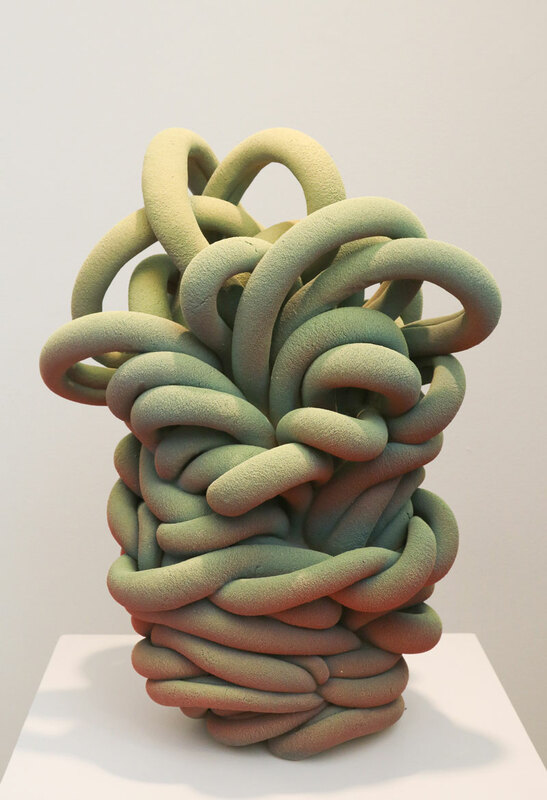 Her unusual tangle of stoneware is strangly beautiful and appears quite huggable. 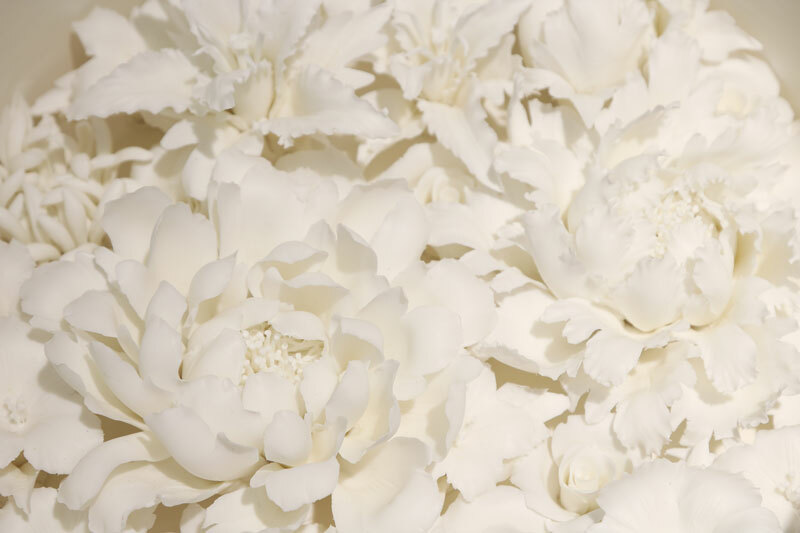 Moving on from the bright and bizarre to the delicate and pure quality from the beautiful white ceramic creations. The beauty is then in the texture and design which creates it’s own shadows and subtle patterns. 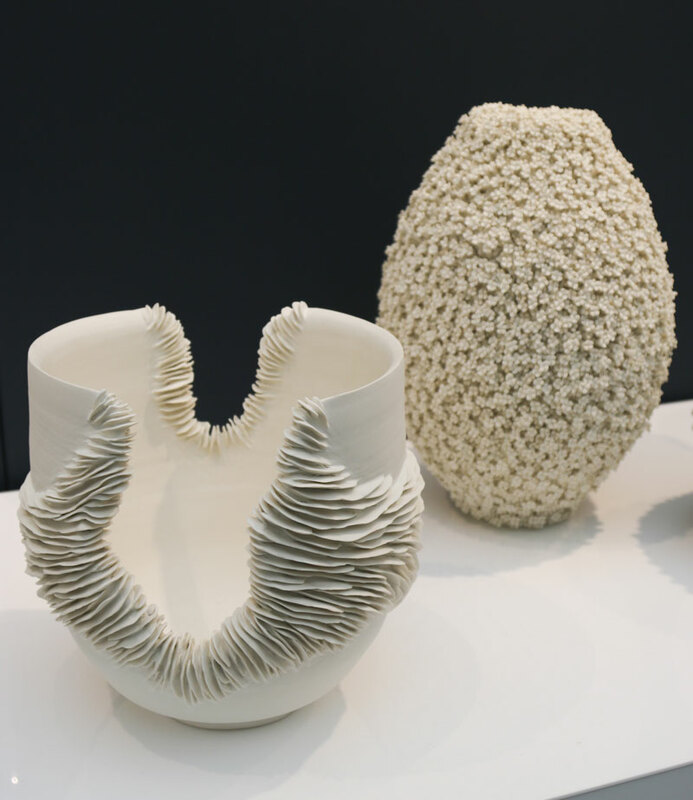 I was totally enraptured by the exquisite dripping eggshell porcelain designs by Bian Xiaodong at the China Design Centre. The work looks so fragile. 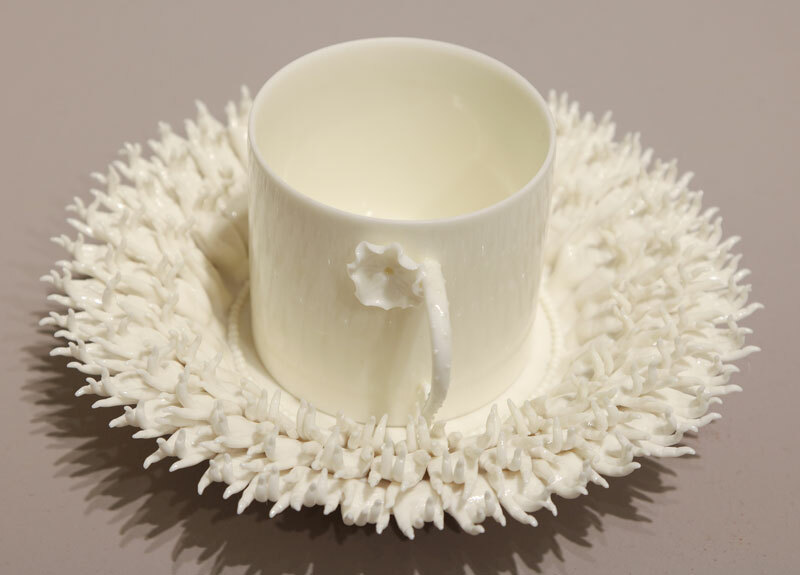 Again, this year, it was hard not be amazed by the delicate porcelain blooms of Peter Ting and also his wonderful ornate Budda Hands Coffee Cup and Saucer . 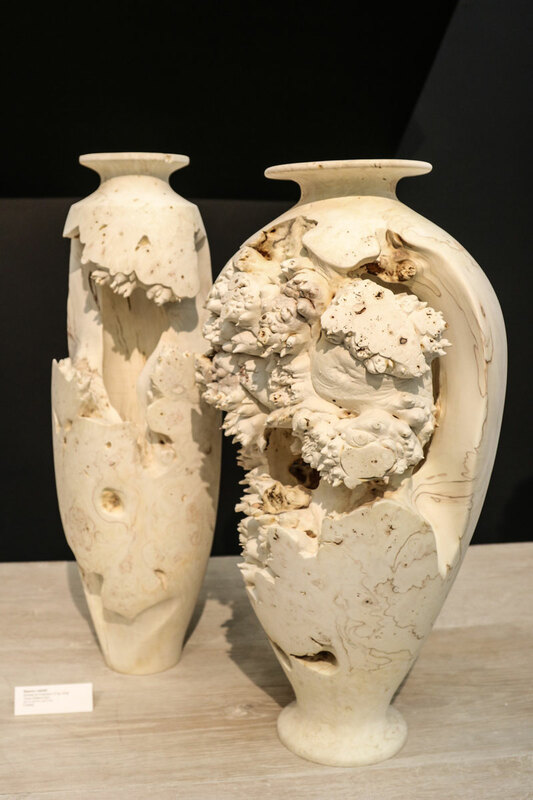 The Vessel Gallery had beautifully curated displays of ceramic artists Olivia Walker and Vanessa Hogge. 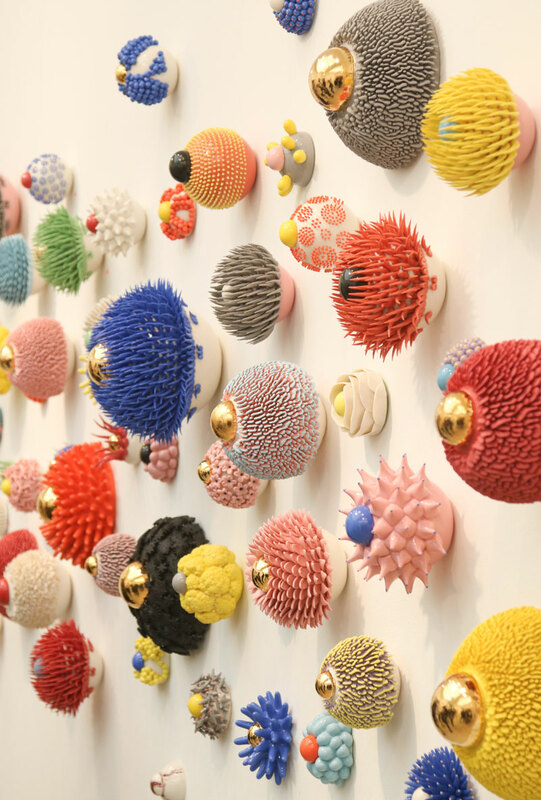 These artists have previously featured in my reviews of the London Design Festival. 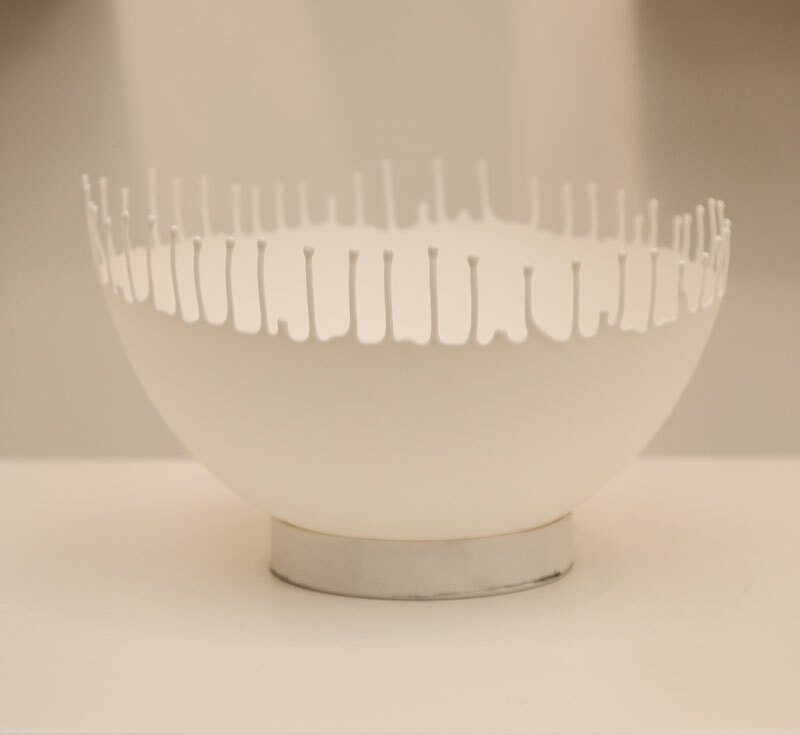 Joanna Bird featured Hattori Makiko’s Porcelain. The surface of his work is textured with delicate folds of paper-thin porcelain. Ikuko Iwamoto’s ‘Golden Pearl’ creation, at Cavaliero Finn, uses serrated edges to cast subtle toned shadows and form. 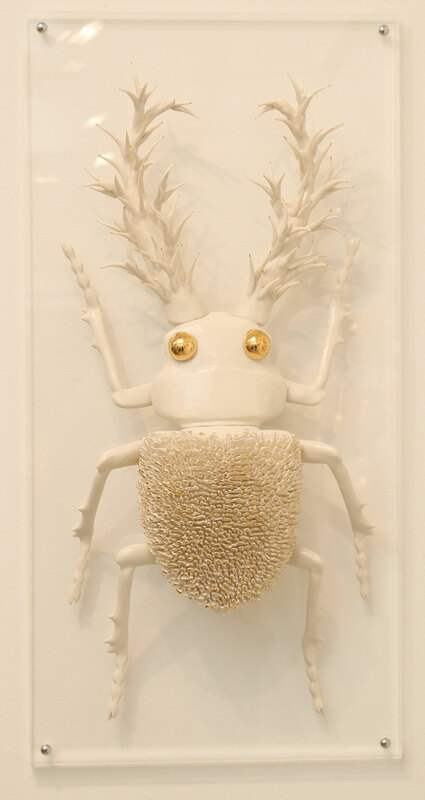 Gold is used again to embellish this creature by Myung-Nam-An at Cube Gallery. 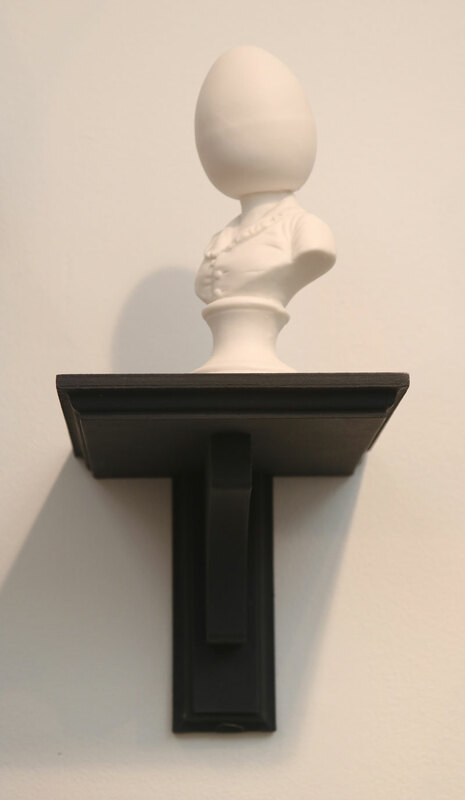 Matt Smith at the Cynthia Corbett Gallery had a collection of quirky sculptures presented in a museum style. 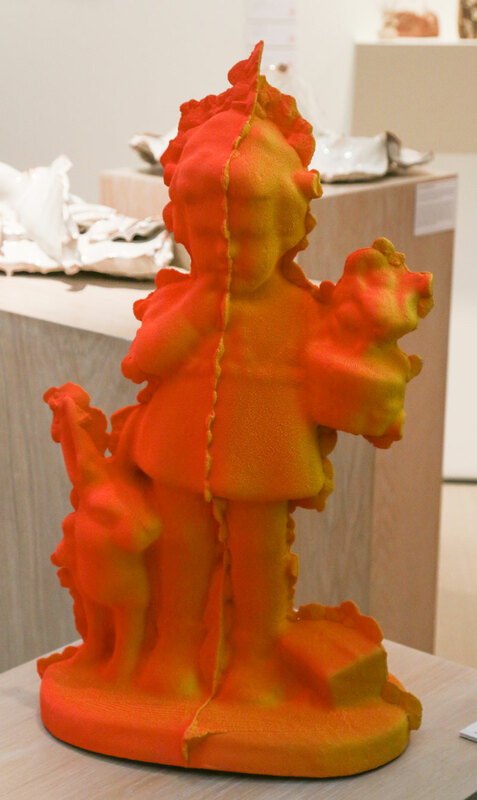 The James Freeman Gallery were showing the work of Caroline Smit. 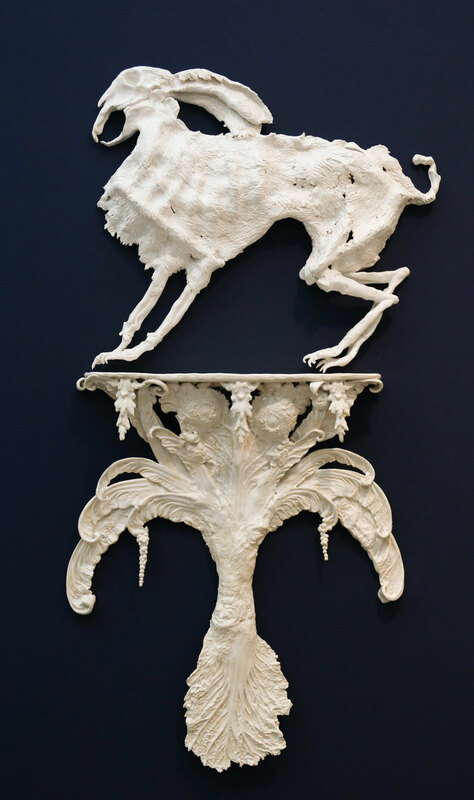 With a historic reference to wall friezes this ‘Hare on a console’ piece, I found intriguing. Featured below are some of the beautiful items on show. 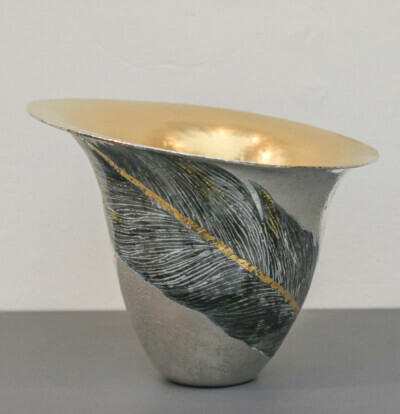 The craftsmanship this year was superb with exceptional pieces from Bishopsland Gallery. 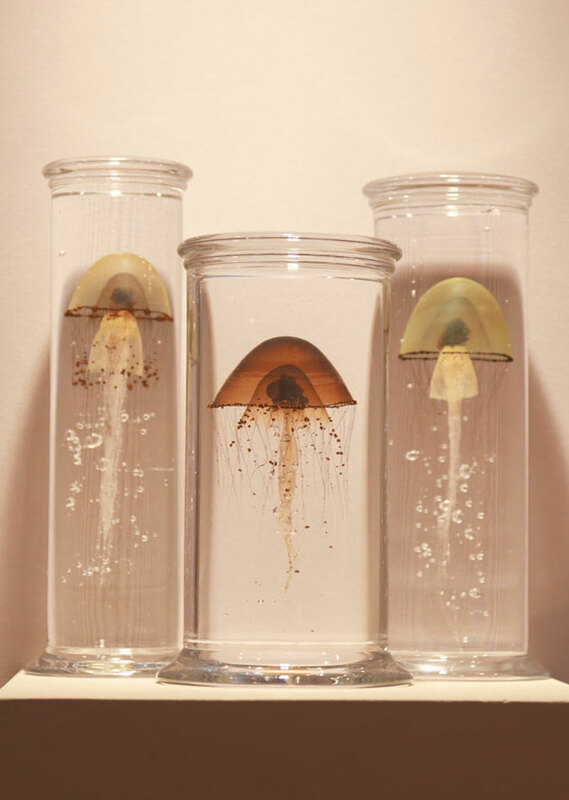 Just take a look at the amazing collection below. 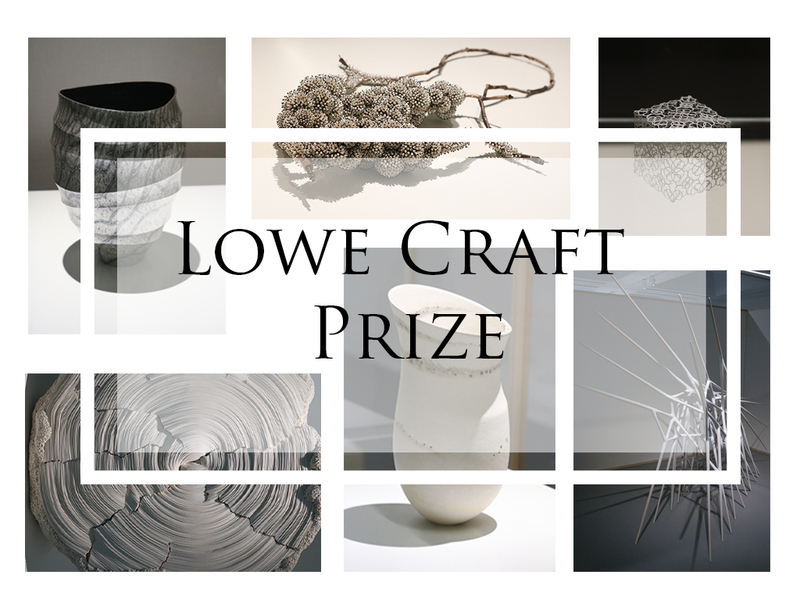 Makers are Ane Christensen, Abigail Brown, Ryan McClean, Sheila McDonald, Byrony Knox and Nan Nan Liu. 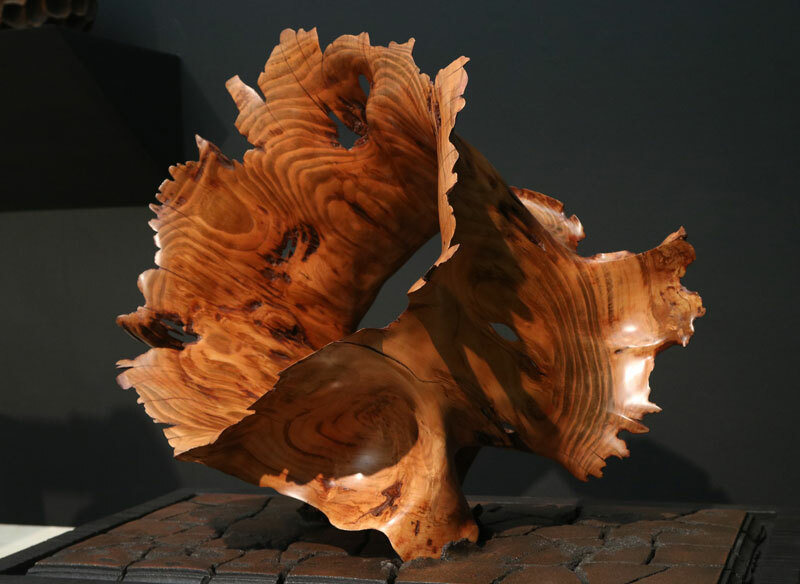 One gallery that aways features some of the best craftsmen in wood, is Sarah Myerscough. 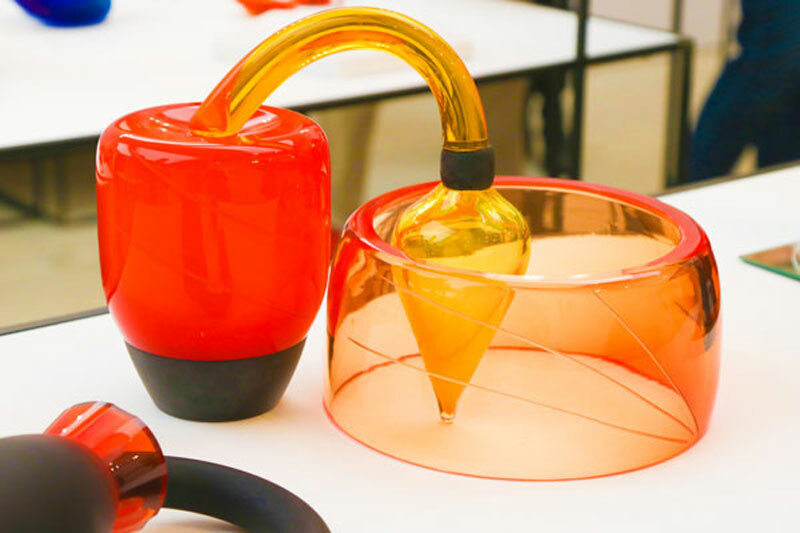 Although I was disappointed not to see Joseph Walsh this year – I did find designers Lasse Kristensen and Mette Bentzen. 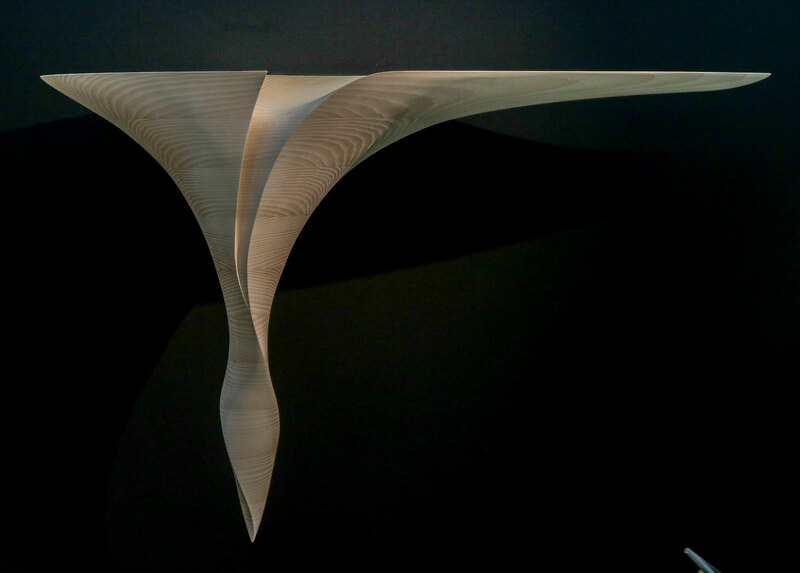 Working in Ash they create beautiful flowing forms such as the shelf below. Also featuring two other great wood sculptors, Nic Webb and Elenor Lakelin. Both use the natural forms and beauty of the wood to create their work. 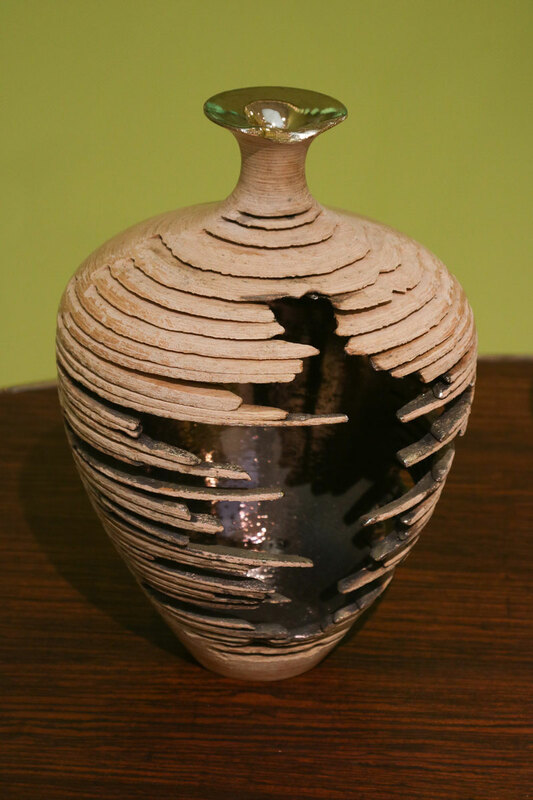 On the Todd Merrill Stand, Marc Fish had a display of handmade, Relic vessels. These were created with 600 layers of laser cut wood veneer. 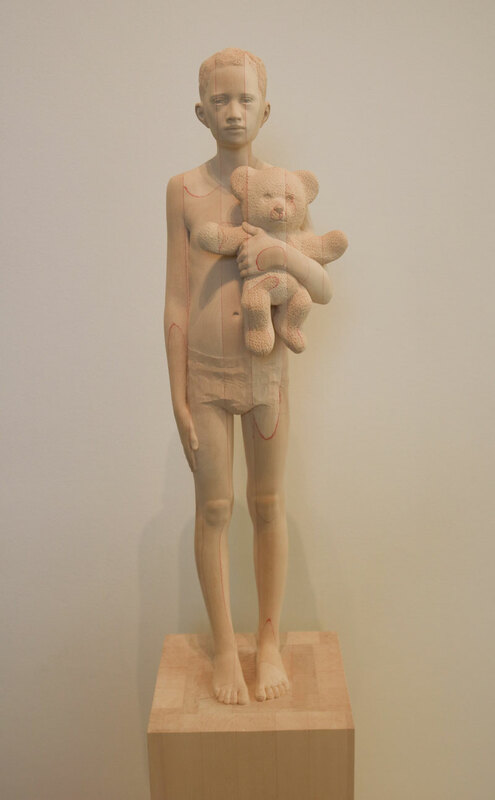 Other more unusual use of wood in design came from Mario Dilitz at Sladmore Contemporary.’ Boy with Teddy bear’ was created in Limewood and red glue. One of my favourite Galleries this year was Todd Merrill Studio. 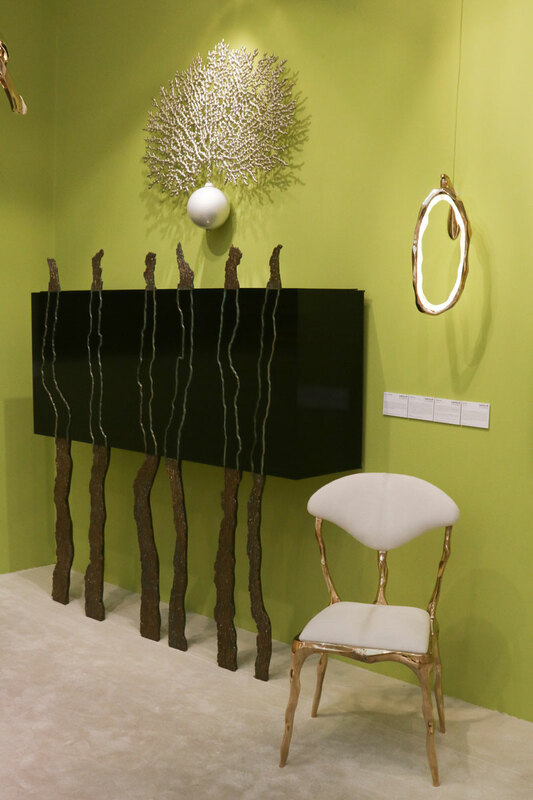 ‘Breakwater’ by french cabinet maker Jean-Luc Le Mournier was a real statement piece. Great oak stakes are drawn onto the front of the ebony cabinet in patinated bronze, symbolise the movement of the sea. Joanna Manousi produced this beautiful ceramic and resin piece. It’s inspired by the carvings of the Chapel at Sudeley Castle, where Henry VIII’s last wife, Katherine Parr, was laid to rest. 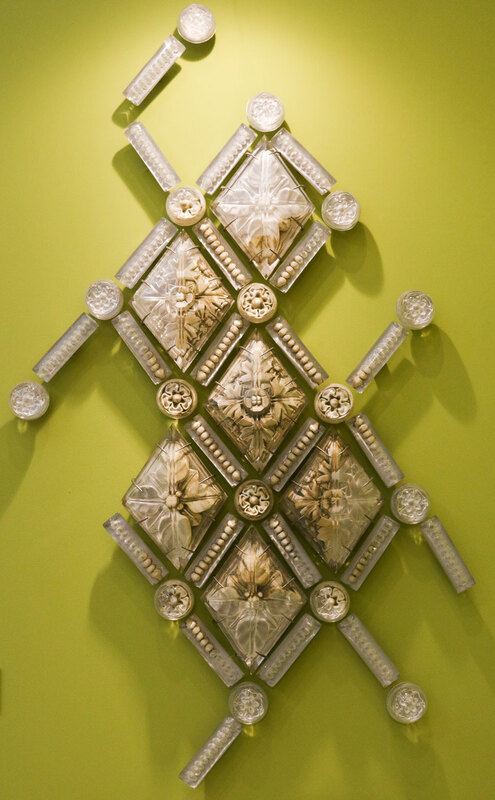 I also had to admire the beautiful wall hanging sculptures of Timothy Horn. 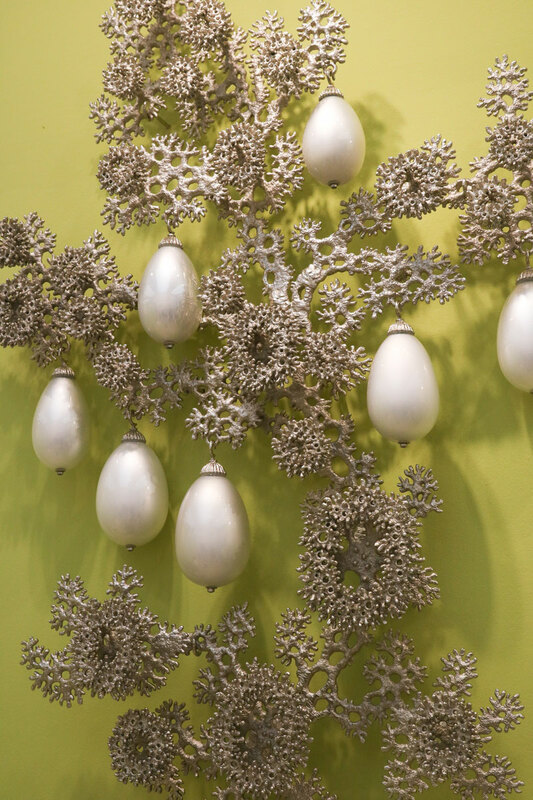 Coral formations in nickel plated bronze are adorned with pearls, created with globes of mirrored, handblown, glass. Replicating the style of historic jewellery, where coral is seen as a sign of wealth. 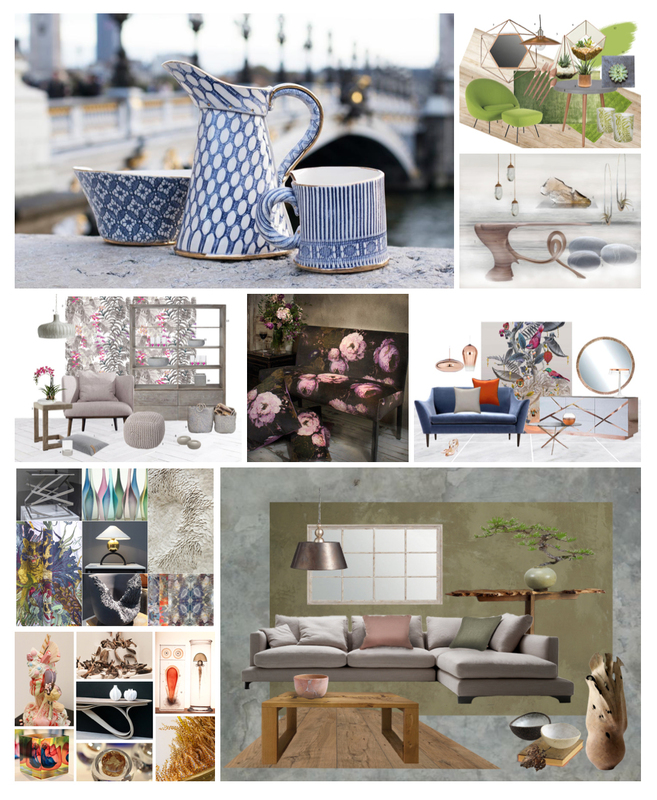 I hope you have enjoyed a brief glimpse of Collect this year. Do you find you are swayed by the challenging concepts of the pieces, or are you just in awe of the craftsmanship and beauty? 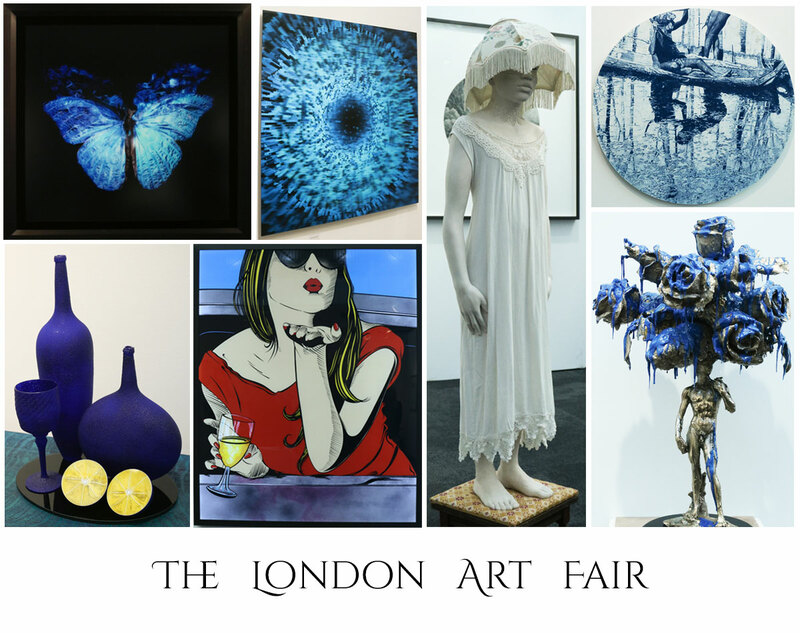 If you visited the show I would love to know your thoughts and which were your favourite pieces – please leave a comment to let me know. What a great source of inspiration! I am particularly keen on Janine Partington’s ‘Marking Time’ because of the meaning behind it! Yes – the work was beautiful in it’s own right – but more so when you feel the emotion behind it. LOVE LOVE LOVE this. I was gutted to miss Collect this year but work and childcare mean I haven’t been to London all year – which is crazy given its only 1 hour away. I love everything you’ve shared – thanks so much for the vicarious ride along. Thank you Mary – it’s a shame you couldn’t get there it’s such an amazing show. So glad you enjoyed the post! Oh wow, so many discoveries! The George Winks cabinet is definitely my favourite. So unique! It was a brilliant experimental piece Karen. His work for the show was based on Victorian Railway station architecture. He explained that he produces very creative pieces and then uses elements of the designs for his more commercial collection. Wow really love so many of these collections! I have to say my favourite is Vanessa Hogge’s work having seen her at LDF. Great post! 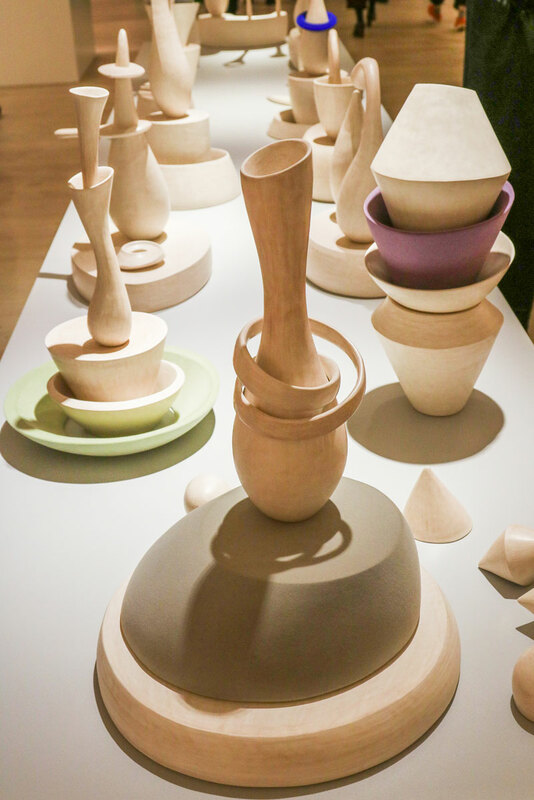 Thank you Maria – yes I first saw Venessa Hogge’s work at LDF – also Olivia Walker makes beautiful ceramics. Such lovely collections. I’ve never heard of this before so thanks! It’s definitely worth a visit Donna! What a stunning selection of work. 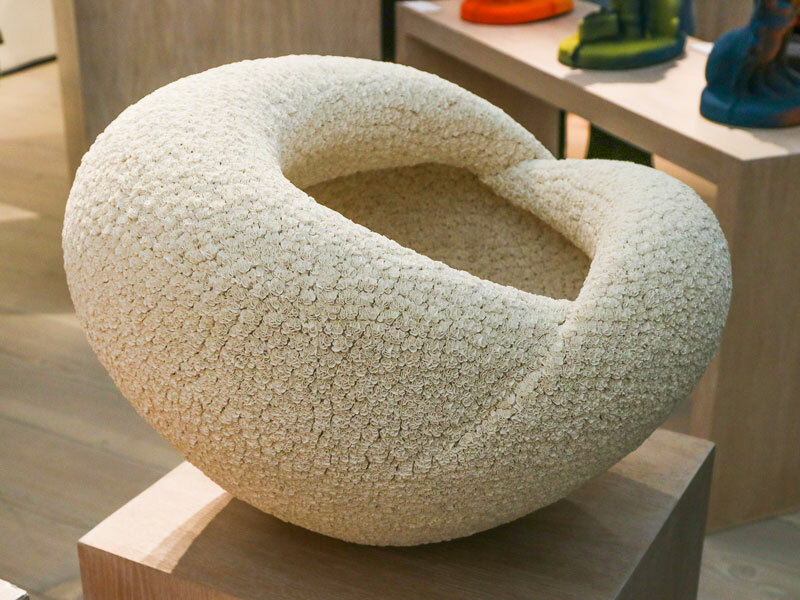 I particularly love the designs from Myung Nam An – the colours and textures are mesmerising! Thank you Hollie. Yes it was really stunning. There was just so much beautiful work this year.